“Paying Rent” is a symbolic recognition of the unjust dispossession of Indigenous peoples from their land, and a reflection of our desire for a more equitable sharing with First Nations in the future. Help us to open our hearts to others, pay attention to our thoughts, words and actions, notice when we have hurt others and change our behaviour in the future. With this Heart Garden we honour the children who were lost or survived the Indian Residential System. “Paying Rent” collections are a biannual event in our church life, and are part of special services: the June service takes place during national Aboriginal celebrations, and the November service during Treaty Recognition Week in Ontario. Through a culture-based approach that addresses the holistic needs of its clients, Na-Me-Res' (Native Men's Residence) mission is to provide temporary, transitional and permanent housing to Aboriginal men experiencing homelessness in Toronto while providing outreach and support services to the broader Aboriginal homeless population. During our first meeting with Na-Me-Res staff, we had a conversation about the history of settlers taking the land, residential schools, and continued racism and inequality. We learned that two of Na-Me-Res’ programmes target individuals suffering from mental health and addictions that can be directly attributed to the continuing social problems stemming from this history. Mino Kaajigoowin (finding something good - finding the good to find self or direction in life) and Ngim Kowa Njichaag (reclaiming the Spirit) address mental health and addiction issues, cultural loss and healing through traditional culture. Through this relationship we were also introduced to elder Jacqui Lavalley who has helped us with our Heart Garden, and have been invited to volunteer at thewir annual Pow Wow at Fort York. The Native Women’s Resource Centre of Toronto provides a safe and welcoming environment for all Aboriginal women and their children in the Greater Toronto Area. Programs fall under six broad categories: Housing, Families, Advocacy, Employment, Education, and Youth. A variety of Cultural Activities are offered for clients and the general public, including the annual Minaake Awards, Sisters In Spirit Vigil, and Winter Solstice. At our first meeting, we had a tour of the building. What impressed us was that people who were formerly clients had become centre leaders. As we watched the children of clients play and learn, we heard from social workers who support homeless women in their dealings with Family Services. The work readiness programs are fully subscribed. We left convinced that a very busy Indigenous staff were healing many, many women to the benefit of subsequent generations. This was our prayer with the children of Trinity-St. Paul’s, Bathurst and Bloor Street United churches as we made hearts that were sent to the closing ceremony of the Truth and Reconciliation Commission in 2015 and planted others in the developing Heart Garden on the North-West side of Trinity-St. Paul’s. That spring we planted tulip bulbs in the form and colours of a Medicine Wheel. Every year they bloom gloriously: red, yellow, black (dark purple) and white. The Medicine Wheel represents the four directions: east, south, west and north and the need to find balance between our physical, spiritual, emotional and intellectual selves. We have been working with Jacqui Lavalley, an Indigenous elder, to guide us in planting and harvesting the four sacred medicines: tobacco, sage, cedar and sweet grass. Each year the children have helped us harvest these medicines and make fresh hearts to “plant” in the centre of the garden. This past June during our “Paying Rent” service we began outdoors with Jacqui, Steve Teekens (E.D. of Na-Me-Res) and Sue Crow Eagle (Two Spirited person, drummer) to plant the tobacco, remember the power of the Spirit and to honour and give thanks to Mother Earth. The Heart Garden is a response to the TRC’s call for permanent reminders of the residential school history. Its goal is to create a welcoming public space for reflection on a very well trafficked corner of Toronto as well as an outdoor space for ceremony. The garden expresses our sorrow for the loss and abuse of so many Indigenous children in residential schools and our hope to build public awareness towards reconciliation with Indigenous people. In the garden, against the backdrop of a church built during the same era that the residential school policy began, we honour Indigenous spirituality. The drawing of the garden illustrates our developing plans. We have hired Solomon King, an Annishinaabe artist who designed The Restoration of Identity garden in Nathan Philips Square, to do the landscaping in summer 2019. The wooden screen has been approved in principal by the TSP board and we are accepting proposals to do this work. The screen is designed in a wave pattern symbolizing energy waves shaped by the circle of creation, on which poetry of lament and the promise of regeneration, written by Indigenous writers, will be inscribed. Future plans will feature a sculpture of a bear holding a child, the inspiration of Indigenous artist Phil Cote. We have received a Seeds of Hope grant of $10,000 from the United Church, to add to the commitment of funds by the congregation. Fundraising in the wider community will help cover the remainder of construction costs. Donate to the Heart Garden Fund here. 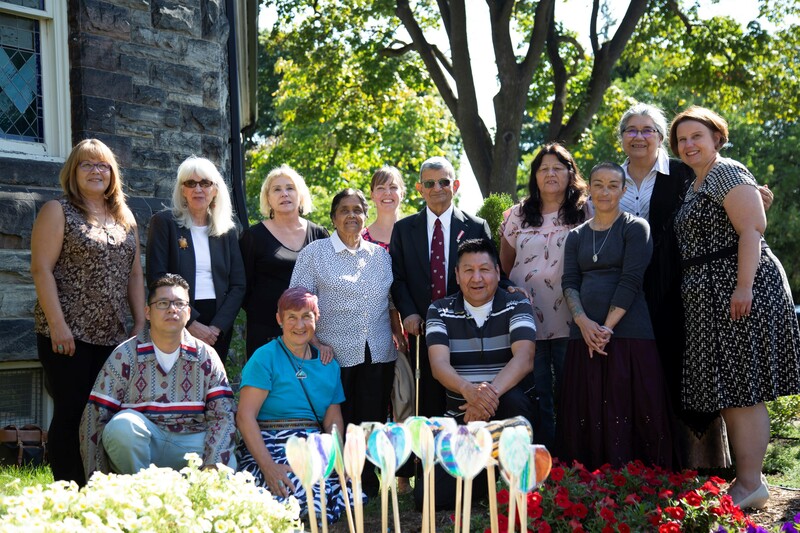 On September 23rd, Traditional Healer James Carpenter from Anishnawbe Health Toronto (AHT), the Indigenous Community Health Centre, conducted a Naming Ceremony to identify the spirit underlying an endowment fund established in support of the new home for Anishnawbe Health Center being built near the Distillery District. James identified the spirit name after conducting a sweat lodge with nine TSP members and then dreaming with the tobacco offered by the members at the lodge. Following a pipe ceremony and announcement of the Spirit Name, over 200 TSPers and guests celebrated with a round dance and generous potluck feast that included bannock made by our youth and children with members of the Indigenous community. The Kind Spirit of Trinity St. Paul's vibrated throughout the sanctuary, dining hall and into the streets with food being carried away to feed people who could not attend.